After working my entire career in the armed forces and coming out of service in 2004 due to injury, then working in the forestry and arboriculture industries, that I found I was far happier being in the trees without a boss. The transition from being in the military to being a civilian is a hard road which I am still travelling down today. Becoming a self-employed freelance trainer, contractor and designer and manufacturer of climbing accessories and survival equipment was my way forward. 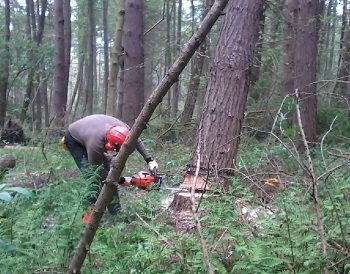 Lowe Maintenance was started in 2004 by me, the ‘Ye Old Bald One’ I provided NPTC / City and Guilds accredited training within the forestry and arboricultural industries. In 2012 things took a leap forward when Demelza, who had been working at a local college for over ten years, came on board. She developed some other areas, for example more agricultural and horticultural based, applying pesticides (spraying), All Terrain Vehicles (ATV’s), farm assurance / audit assistance for farmers in schemes such as the Co-op and Red Tractor. Demelza has been really busy expanding Lowe Maintenance since she came on board and over the last six years has developed and expanded the Lowe Maintenance offering providing not only amazing but high quality training sessions and courses to professionals, amateurs and domestic candidates. Lowe Maintenance Training is situated on the main street in Settle, Skipton in the rolling Yorkshire Dales, a picturesque market town (associated with the Settle Carlisle railway) has all the hustle and bustle of many visitors. We strive to accommodate a variety of clients including: local, regional and national farmers, landscapers, gamekeepers, conservationists, arboriculturalists, tree surgeons, IRATA companies, Stobart Rail, Natural England, National Trust, Yorkshire Dales National Park, Tactical Training centre, Ministry of Defense, county councils, golf clubs.